I love gadgets. Show me a thingamabobber or a whatchamacallit and I will start coveting like a kid covets chocolate cake. Ever since I fell in love with the Aerlit shuttles, I have been looking for someway to avoid having to wind bobbins by hand. My first thought was to try and wind them on my sewing machine, but when I came to my senses, I realized that would be like putting out a match with a firehouse. 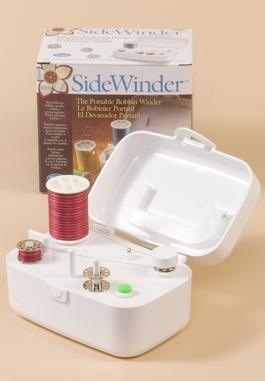 After looking at some different bobbin winders, I decided that the Simplicity Sidewinder was my new love. As much as I wanted it, I could just not justify spending $30-$35 because i was to lazy to wind them by hand. Fast forward to a couple of weeks ago when I attended the Shuttlebirds Annual Workshop. There is was, the object of my desire as one of the raffle prizes. (I will write a whole blog on just the giveaways they have at wotkshop.) I put my ticket in on Friday and said a little prayer to the Tatting Goddesses. Finally, Saturday afternoon, they started awarding the raffle items. The people at my table were highly amused at how excited I was at just the idea that soon it could be mine. The first items they pulled tickets for were some shuttle winders. I applauded for the winners but I was not really focused because I was next. I hear Patti say, “And the second bobbin winder goes to…” and she reaches into pull out the second ticket and I start chanting softly, “MEMEMEMEMMEMEMEMEMEMEME” and lo and behold, it was ME! At first, I thought I had imagined it, but nope, it is now mine and I will love it hug it and call it George. If you use bobbins, this is the way to go. Not only does it wind a bobbin in about 30 seconds, the bobbins are wound evenly and hold so much more thread. I put my ball of thread in the top of my Handy Hands Thread Holder, but a small bowl will work too. If I am winding a bobbin that will be cut from the thread, I use the thread guide as instructed. If I am winding CTM, I just skip the guide and put the thread through the tensioner then on to the bobbin. I tie the thread around the bobbin with a long tail. The tail goes thru the whole in the top of the bobbin and I hold it as the bobbin starts to wind. After a second or two, I stop the winder, cut off the tail, and then let it fly. The Simplicity Sidewinder was really worth the wait. The biggest problem I have with it, is simply that I need a new gadget to covet. Any hints out there? What can’t I love without?